Known to me only from the literature. Fruitbodies with partial veil, soon disrupting and leaving a ring in the upper part of the stipe. Cap up to 25 cm, orange-brown to ochraceous with orange tint, sometimes paler towards the margin, surface smooth and distinctly viscid. Stipe cylindrical or slightly swollen below, solid, dirty whitish to cream, darkening in the lower parts with age, below the tubes with a distinct orange-tinted ring. Flesh yellowish to yellowish-white, unchanging when exposed to air. Tubes short, decurrent, yellow to greyish yellow. Pores more or less angular, concolorous with the tubes, darkening when bruised. Smell not distinctive. Taste not distinctive. Spores 8–10 ´ 4–5 μm. Habitat. Stands of Douglas’ fir (Pseudotsuga), with which tree the fungus is strictly mycorrhizal. Similarity. 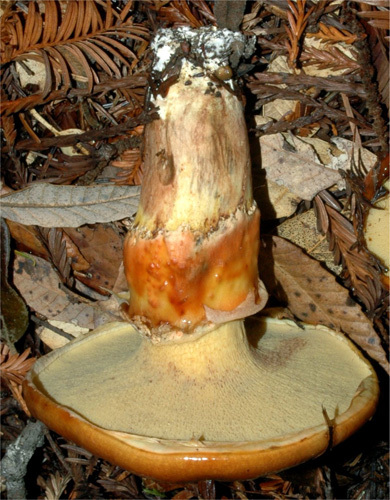 Compare with the other Pseudotsuga-associated species of the genus – Suillus lakei, S. caerulescens and S. imitatus. 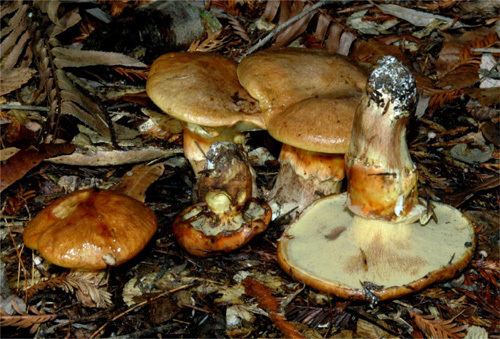 Due to its specific habitus Suillus ponderosus might superficially resemble some of the members of Suillus sect. Larigni, and especially Suillus grevillei, which grows only under larch (Larix).